This multi-platform wireless desk keyboard is designed for use with your computer, tablet, and smartphone. The universal keyboard utilizes Bluetooth wireless technology to connect you to a wide variety of devices. Just turn the Easy-Switch dial to switch typing between the connected wireless devices. You'll find a familiar keyboard layout with all the shortcut keys you use the most, and the integrated cradle holds your phone or tablet in place. Wired/Wireless: Wireless; Maximum Wireless Range: 10 ft; Connector/Port/Interface: Bluetooth; For Device Type: Laptop; Smartphone; Tablet. 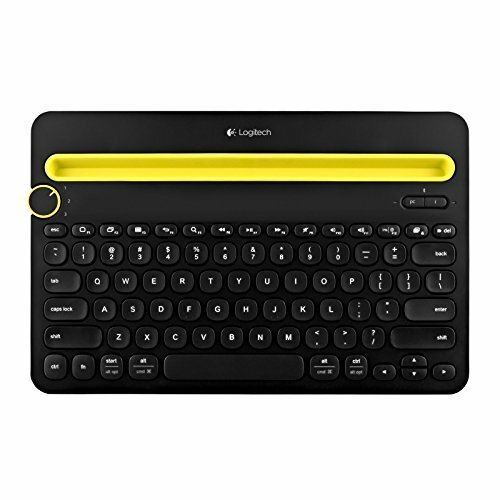 Type-on-anything universal Bluetooth keyboard?computer, smartphone or tablet. Built-in cradle holds your smartphone/tablet at the ideal angle for viewing/typing. Familiar keyboard layout for computer, tablet and smartphone users?with all the shortcut keys you need.